Sophisticated downtown Ann Arbor condo living many with unique original architectural features in a converted former warehouse building. Walk to all that Ann Arbor has to offer. Secure indoor & outdor parking on site. 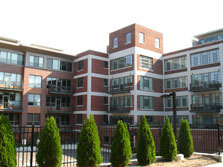 Just click below for details of recent sales or available units at the Liberty Lofts development.